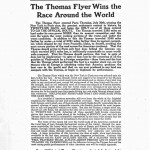 As many of our readers know the 1907 Thomas Flyer shown here, won the grueling 22,000 mile, New York to Paris Race in 1908. The race has been covered many times over the years by the media and it is not our intent to rehash it here. What prompted this post was the discovery (thanks to Tim Martin) of of these lantern slides from the Collections of The Henry Ford. The slides are a part of the collection of Henry Austin Clark, Jr. photographs collection, that he donated to the museum. 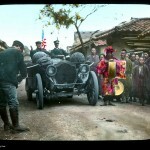 The lantern slides show; (above) the Thomas Flyer in Times Square before the start of the race, (below left to right), parked in front of the Elkhorn Saloon in Wyoming, in the mud in Russia and with a village Priest in Japan. 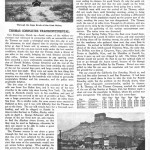 To learn more about the race visit the New York Times, were you can read a very good overview of the race written on the centennial in 2008, by the newspaper which originally was a cosponsor of the race, along with the Parisian newspaper Le Matin. The car has survived in good form and can be seen at The National Auto Museum. 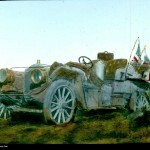 The car that Thomas used in the race was actually a 1907 60 h.p. 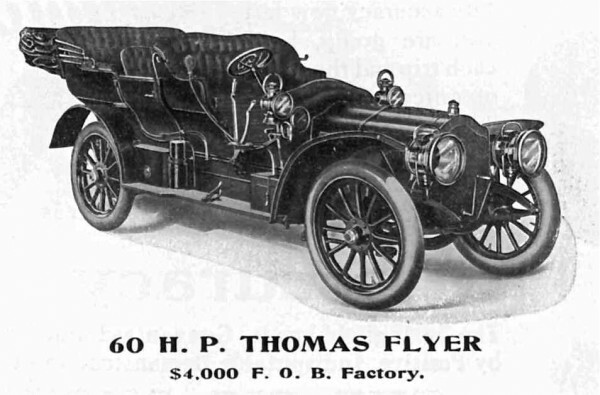 model, as seen above in a period Thomas advertisement. The company hastily equipped a 1907 model chassis with the coach work it wore in the race and at the (middle below) you can read one of the firms advertisements touting its success. 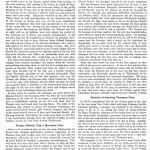 On the (left and right below) are two accounts that were in The Automobile Magazine telling about the beginning and end of the famous race. 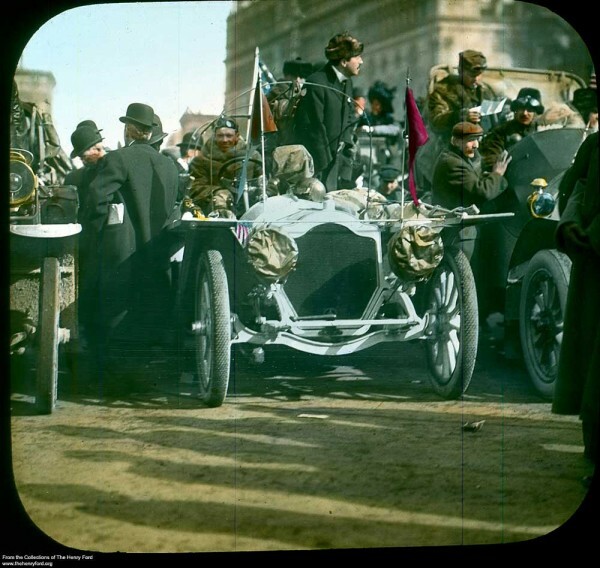 This entry was posted in Auto photos 1885 - 1920, Auto Racing 1894 - 1942, New York to Paris Race and tagged 1907 Thomas Flyer, Henry Austin Clark, Jr., The 1908 New York to Paris Race. 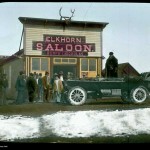 That photo of the Elkhorn Saloon was taken in Medicine Bow, WY, likely by Charles DuPez. The little REO pilot car, nicknamed “The Rabbit”, is seen parked behind. I have a copy of the original shot, but I have never seen this colorized version. Just wonderful. Robert, Thanks for the details.